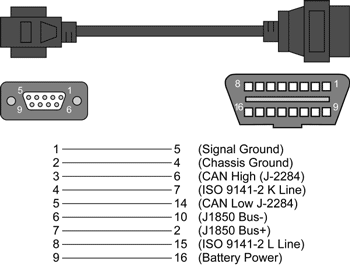 Where can I buy an ELM327 interface? There are several types of interface. The most common use a chip made by ELM Electronics. The ELM327 is the most widely used and practical, supports all OBD protocols, i.e. KWP, PWM, VPN and CAN. The other circuits only support one protocol: The ELM320 only supports PWM; the ELM322 supports VPN and the ELM323 KWP. Which communication for my interface? The ELM327 RS232 (RS or Series) : This type of output is gradually disappearing from modern PCs. The ELM327 USB : It requires installation of a USB driver (FTDI or Silicon Labs). Advantages: all PCs are equipped with a USB port. The ELM327 Bluetooth : It has the advantage of being wireless and can be used with a computer or an Android smartphone. The ELM327 WiFi : Its wireless connection means it can be used with a computer or a smartphone. Only the WiFi interfaces can be used with the iPhone/iPad. Despite appearances, these 4 interfaces are practically identical, at least electronically. Only their external aspect and the connection type differ. 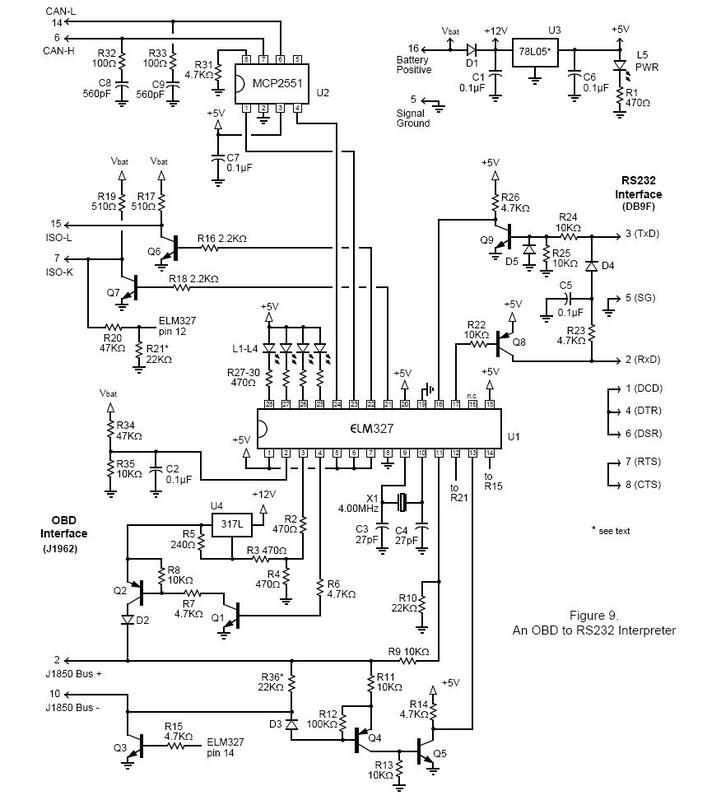 At their heart is an ELM327 circuit. Those 4 interfaces will send back the same result during your car diagnostic. Another thing which may be confusing is the "firmware" version. that may vary. The official versions currently in circulation are 1.3a and 1.4b. Only very advanced users can tell the difference between a 1.3 and a 1.4 as the basic diagnostic functions are identical. On the net, you will also find version 1.5. We have bought one and can confirm that it doesn't exist! It is only a copy of version 1.2 masquerading as 1.2. Check out our tips and advice section for how to know which ELM version you have. New : Elm Electronics have just released version 2.1 of their ELM327 circuit. Where can I buy an ELM interface? With each klavkarr interface, we include the licence for our EOBD-Facile software. As we have the interface in stock, it will be sent to you in maximum 48 hours by parcel post. Our klavkarr interface is easy to use and do no require informatic skills : it is Plug & Play. The interface comes with the demonstration software only in English. The price includes any customs costs or additional VAT (sellers outside the European Union). Some sellers outside the EU do not include customs duties. The delivery company will ask you to pay them on delivery (about 20% of the declared value of the goods or sometimes a fixed cost of about 20 Euros). Delivery method. If you are not at home during the day, prefer delivery by the post office. Companies like DHL, Fedex, UPS often require you to be present during the day to take delivery of the goods. For foreign companies, check the delivery time (which can be up to 15 days). >Also check that in the event of failure of the device, the seller will replace (or refund) it. RS232: no installation is required. USB: You must install the USB driver for the interface (available in the download section of the site) to connect the interface to your computer. Bluetooth: You need to pair the interface to your computer before use. The code is 1234. WiFi: You need to define the wireless settings on your computer (more details in the software help file). Connect the interface to your vehicle's OBD connector. Connect the interface to your computer's USB port. Switch on the vehicle ignition. The engine indicator on the dashboard should be lit. Click on Connect. The software will automatically connect to the vehicle. In the event of a connection problem, consult the software help file. Power (red LED): Indicates that the interface is powered on. This indicator must be fully lit for the interface to be correctly powered. Tx OBD (yellow LED): Flashes when data are sent from the interface to the vehicle. Rx OBD (green LED): Flashes when data are sent from the vehicle to the interface. Tx USB (yellow LED): Flashes when data are sent from the PC to the interface. Rx USB (green LED): Flashes when data are sent from the interface to the PC. Tip : On some interfaces, there are no labels on the indicators. In this case, when you power on, the red LED lights first followed briefly by: 1. Tx OBD, 2. Rx OBD, 3. Tx PC, 4. Rx PC. Electrical voltage adaptors: On-board networks in cars have voltage levels that require specific drivers. 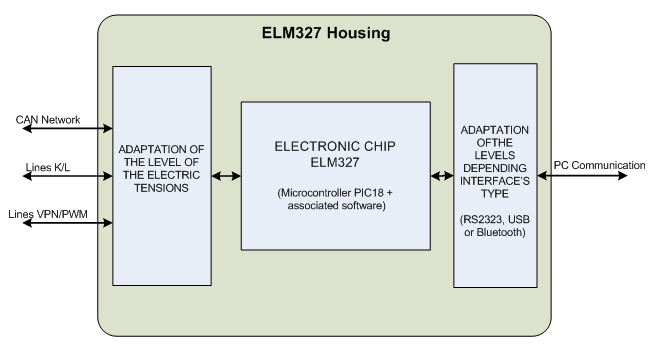 For an ELM327, as the device supports several protocols, several drivers are necessary. These protocols can be classified into 3 families, CAN networks, K/L lines and PWM/VPN. For more details about these protocols, see our page communication standard. The ELM327 chip: The integrated circuit, which gives its name to the whole device, is the brains of the interface. It selects the protocol and converts it into one understood by modern PCs. This small circuit (speed 4Mhz) acts as a bridge between the protocols. Voltage adaptors for the PC: The electronic chip is not in itself able to communication with a computer; it needs to adapt the electrical levels before sending data streams. The diagram below shows the main function of an interface. After this brief presentation, the term "interface" should mean more. The role of the ELM327 is to act as an interface between 2 different environments: the car, governed by standards with a high level of reliability and a low price, and the IT world more focussed on modularity. How do I know which software version it is? If the interface replies "OK", the command is supported. Otherwise a "?" will appear meaning the command is unknown. Important : After this manipulation, remember to "reset" the connection if you want to continue to communicate with your vehicle. This little test will enable you to determine what level of function is installed in your interface. Even if this is only a simplified version of our complete procedure, it is effective and fast. Our software is 100% operational with interfaces from version 1.2, even though it uses some commands from version 1.3, there is no impact on function. If your ELM interface breaks down or if you want to create your own circuit, the diagram below will help you. It shows the circuit of anELM327 RS232 interface. The basic circuit is always the same whatever the connection mode (RS232, USB or Bluetooth). The difference lies mainly in the components connected to pins 17 and 18 of U1 (ELM327 integrated circuit). For USB interfaces, a VCP (Virtual COM Port) component is used to "convert" an RS link into USB like USB adaptor cables <-> RS232. There are currently two families of components in the ELM327. The manufacturer FTDI with the component FT232 (more details on the FTDI site) and Silicon Labs with the component CP210x (more details on the Silicon Labs website). Bluetooth interfaces use an RS modem.<->Bluetooth. WiFi interfaces use an RS modem.<->WiFi allows wireless communication. ELM Electronics has created a very good and practical application note with the voltage levels and a test procedure. 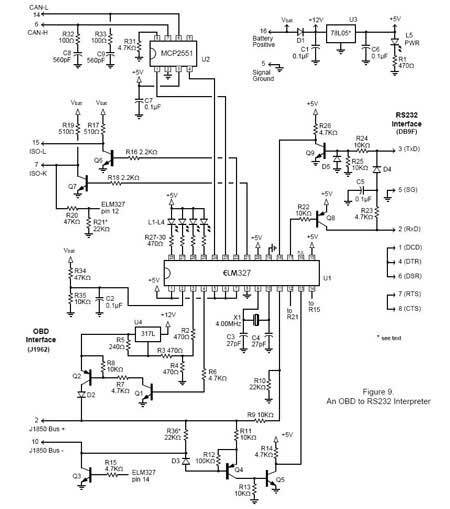 This document can be found at the following address: http://www.elmelectronics.com/AppNotes/AppNote02.pdf. Only ELM interfaces are supported by our software, but other companies have developed interfaces with functions similar to the ELM circuit. For example: http://www.ozenelektronik.com and their interfaces myOBDics. On the market, there are also professional products, such as those used by manufacturers such as Clip, Lexia, etc. They remain expensive however. In addition, their special nature makes them usable only by maker family, unlike the ELM.